Our HVAC adjustable 90 Degree elbows are are used to make turns in runs of round pipe and flexible duct from O (straight) to 90 degrees. They are also crimped on one end to easily fit into a pipe or duct fitting of the same diameter. They have a sturdy galvanized steel construction and are simple to adjust, and fabricated from premium G60 galvanized steel. They are the fitting to use when needing to make tight corners and are utilized for maintaining the best airflow for maximum efficiency in your HVAC system. These elbows are made of 26 gauge galvanized sheet metal up to 12" or 24 gauge galvanized sheet metal from 14" to 24". 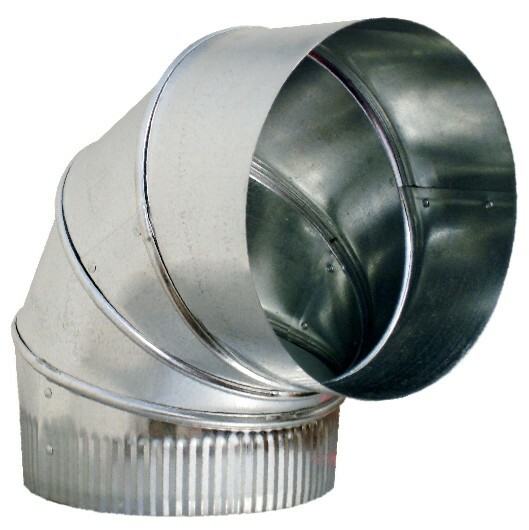 Ideal application with either flexible duct or sheet metal duct.